"He was just being him. It seemed so natural, the way he knew how to help. He was holding my hand even rubbing my back." Solon — Baby Oakley Michael Przepiora weighing in at 6 lbs 10 oz is a precious peanut who wanted out. And he was PERSISTENT about it. His parents, running out of options, ran into a policeman named Paul and the rest, in their words, was “meant to be." It was clearly a case they don't cover in Lamaze class. Shaker Heights police officer Corporal Paul Rypinski didn't have a playbook either. 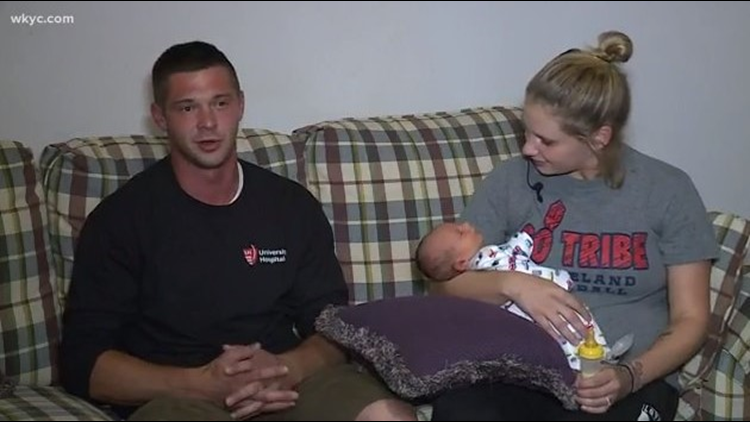 But the story starts when Gabrielle Wiseman and fiancee Matt Przepiora, along with baby to be, were staring at standstill traffic Tuesday morning on US 422. "The contractions were getting stronger and stronger," Wiseman says. The parents pull over and see Rypinski in his cruiser. 'We need some help officer, the baby is coming out NOW,' they told the officer. "And he just jumped out!," Wiseman and Przepiora recount that part of the story together like an already married couple who finishes each other’s sentences. “Before they knew it, he was holding my hand, coaching me. A Godsend really," Wiseman says. Rypionski, they said, went beyond the badge when seconds counted. "He was just being him. It seemed so natural, the way he knew how to help. He was holding my hand even rubbing my back,” Wiseman says. Przepiora adds, “I stepped back because I was thinking, 'this guy knows what he's doing'!" "He called the ambulance and they were there in 2 seconds flat," says Wiseman. "Just watching all the traffic we passed in the ambulance, I was like oh, thank The Lord" said Przepiora. 8 minutes later, the mom and dad to-be and now "Uncle Paul" are at University Hospitals. Shaker Heights Officer Paul Rypinski. The kind man behind the calming voice on his body cam recording when everyone believed baby Oakley was about to be born in a car. "I probably dropped every cuss word in the book. Officer Paul is like, 'it's ok. Just do it! You're allowed.' He was just like an angel," Wiseman says. An officer angel who even sends flowers after he saves the day. "He just jumped on it like if that was my kid, that’s what I would do. I just saw it. I felt the love from him," said Przepiora.